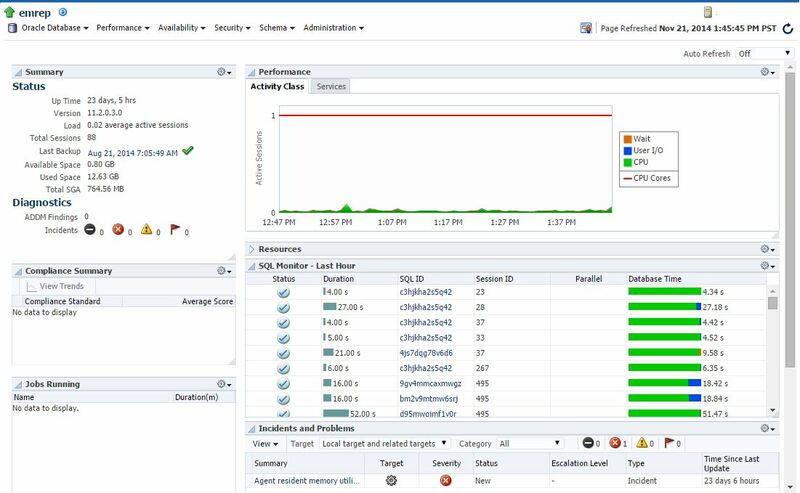 One of the key features for Database administration in Enterprise Manager 12c is the Performance pages utilizing the Diagnostic and Tuning packs. The DBAs are very familiar with these. Many customers are starting to ask how to let their Developers access the performance data without allowing full access to production. As soon as they try to dig further into the SQL or Schema, they will be presented with a login box. The EM user must have Connect/Connect Target Read-only privilege to get a login prompt to a target. You can either use a Named credential, or create a New credential. If the EM user has access to Named credentials, they will be able to save the credential and set that as a Preferred credential for this target. If the Preferred credential is set, the login will be automatic from now on. From here, what the user can do is completely dependent on what that login was. Do you have sys as sysdba logins? If so, you can do just about everything. Or do you have a restricted read-only database account that limits your actions? Whatever database account permissions were set are still enforced through EM. So the question is… what permissions do you need? As with any user account in an Oracle database, you have to specify explicit privileges or roles to be able to access certain pieces. Just as you would have to grant select on X table, you have to grant access to specific performance views and functions. For basic view permissions on the Performance pages, the user needs at a minimum create session and select any dictionary. If you were able to login, then you already have create session. So let’s grant select any dictionary. That works great for the Performance pages, but let’s say you want to run an AWR report, can we do that? 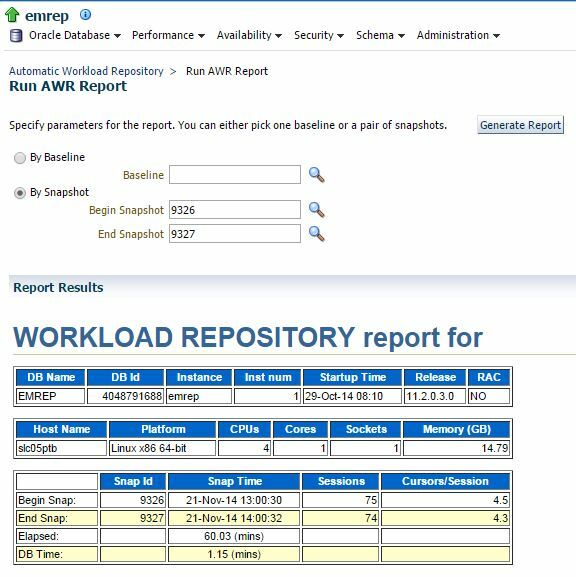 Now you can successfully run ASH and AWR reports from EM. 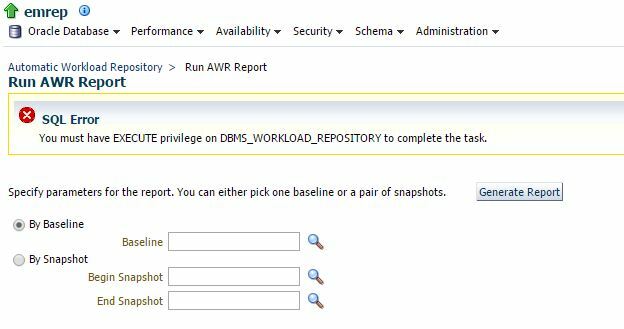 For SQL Tuning Advisor, you’ll need to create a SQL Tuning Set and have permissions to dbms_workload_repository and administer the SQL Tuning sets. Once you have these additional permissions, you’ll be able to successfully create a SQL Tuning Advisor job and receive the results. These are some of the more common performance tuning privileges required to use the features through EM, however there are a lot of other features that could be accessed. Depending on what functions the user requires, you may need additional permissions at the database level. For additional privileges required, see Where to Find Information About Performance Related Features (Doc ID 1361401.1). Hopefully this short blog will help you start to think about what roles and permissions your database users might need in order to make full use out of the Oracle Enterprise Manager Performance pages!